It produces a more detailed image than an X-Ray image. 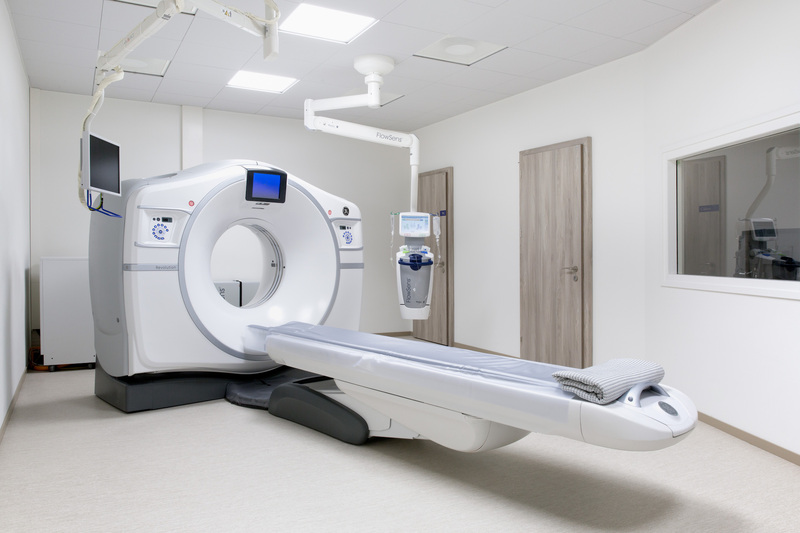 The CT scanner consists of an X-Ray tube which rotates around the examination table as it slides through a ring. After having gone through the body, the residual energy of these X-Rays is measured by detectors on the opposite side of the ring. This data is transmitted to a computer, which generates cross-sectionnal pictures and displays them on a screen. Before having a scan, you will be asked to remove anything metal, such as jewellery, as it interferes with the images. If you are having an abdominal scan, you might be given a contrast liquid in order to opacify and allow better analysis of the digestive tract. This can be swallowed or passed as an enema. During the scan, you usually lie on your back, on a flat bed that slides through the CT scanner. This is a short ring, so you shouldn’t feel claustrophobic. While each scan is performed, you will need to lie still and breathe normally, ensuring that the scan images aren’t blurred. You will be asked to breathe in, hold your breath and breathe out at certain points. During the intravenous injection of iodine-based contrast medium which is sometimes needed, you might experience a heat sensation and/or a metallic taste. This is perfectly normal. The procedure will usually last 10-20 minutes. Punctures, infiltrations or biopsies may also be performed under CT guidance, allowing a precise positionning of the needle for optimal therapeutical effect or diagnosis. Fasting 4 hours is required before brain, neck, thoracic, abdominal CT and angio-CT scans. A preparation for virtual colonoscopy will be communicated to you upon making an appointment. No preparation is required for bone and spine examinations.